We have been monitoring the weather for the past week and at the moment we are subject to a low pressure system with a forecast of high winds on Saturday. To that end, we want to bring to your attention a change of course to ensure safety of the fleet and at the same time guarantee you a challenging and enjoyable event – The Sheltered River Course. We are delighted to offer rowers and paddlers a chance to race on the historic and beautiful stretch of river, where in times past thousands supported the regattas of the day. 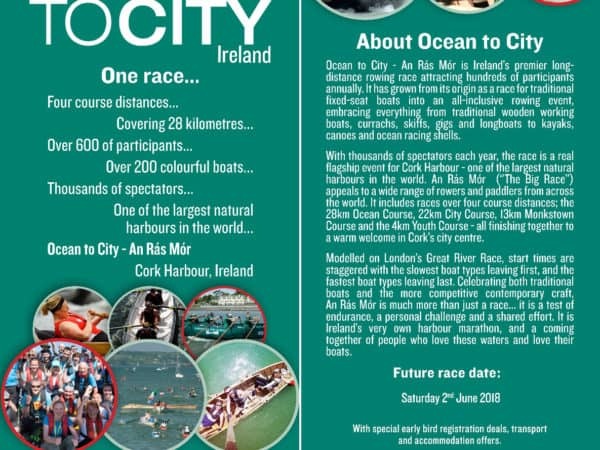 Participants will start at the 19th Century Custom House; racing along the north shore to the Port of Cork working docks at Tivoli; crossing to Blackrock Castle and passing back on the southern shore along the Marina. 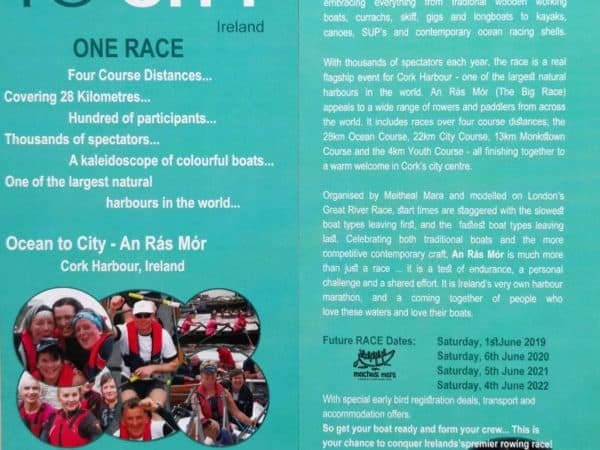 Participants on the City and Ocean Courses will do two circuits totalling 20km, and participants on the Monkstown Course will do one circuit of 10km. Your race pack will contain: alternative course map, launch & recovery information, orange flag, regulations and general information. Launch: We are currently developing alternative launch and recovery plan to get all craft afloat in the city. We have allocated each boat a dedicated launch and recovery area have communicated this as best as possible on Friday. Launch volunteers will be in place to assist between certain times. Kayaks, SUPs, Canoes: At the pontoon at Lee Rowing Club. Scroll down for exact timings. Sliding-seat boats that can be lifted: At the public pontoon at Lee Rowing Club. All Currachs and lighter rowing boats that can be lifted / trolleyed in: need to be recovered from where they launched. Heavy boats: Will be by crane after the race. Our team of volunteers will work hard to get every boat recovered as fast as possible. With over 100 boats to handle, we would ask for your patience while our volunteers do their work. Download recovery instructions. Please note that our former car park at Navigation House is not available this year. There will be an alternative parking area at the end of Kennedy Quay, 550m east from the Crane Recovery Area. Larger boats and trailers will have priority, then kayaks and cars. Location & Directions: Please click here. Park your trailer at the Kennedy Quay car park in Cork City, between 17:00-21:30. You will received an email on Friday telling you where and when to launch your boat on Saturday morning. Please launch only from the area designated to you. You will receive an email on Friday telling you where and when to launch your boat on Saturday morning. Please launch only from the area designated to you. Park your trailer at the Kennedy Quay car park in Cork City from 09:00. To facilitate movement between the various launch locations, we will be arranging a special Shuttle Bus which will be circulating 10:00-12:00 between Albert Quay and the Marina on Saturday morning. No tickets will be needed. Boats: 12:30 on Custom House Quay at the Port of Cork, shortly before the race starts. Kayaks: 12:15 near the pontoon by Lee Rowing Club, before any kayaks are launched (exact time TBC). The first boats will be started at approximately 13:30. Boats will start to arrive at the finish line between 14:15 – 17:15. Please assist our safety by de-registering as soon as you have finished the race. De-registration is an important record for us that participants have finished and are safely ashore. The de-registration tent will be located near the top of the Port of Cork Pontoon. Kayakers are required to return the special bibs as they are on loan from the ICU. Showers will be provided free of charge at the Clayton Hotel after the race. With the change of course we will not be able to start the race on the usual handicap basis. We plan to present prizes as follows: (a) within Boat Type Classes (b) within Age & Gender classes within the same Boat Types (c) Special Awards (d) Fun Awards. For boats that do not have their own boat class we will also apply a retrospective handicapping calculated on times, in the week following the race. The Prize Giving Ceremony will still take place from 19:30 at the Clayton Hotel Cork on Lapp’s Quay. Prepare for up to 3 hours on the water, with appropriate protection for the elements. Conditions can change on the open water, and protection from both cold, wind and sun is recommended: sunscreen, rain gear, layered clothing, hat/cap, shades, etc. Respect for Rules of Racing will be particularly important this year, given the restrictive racing area on the river. Please be mindful of each other and obey marshal instruction. Note: The marina road will be operating a one-way traffic system, starting at Blackrock Village going west towards the city. If you can carpool, please do. Arrive: 10:00-11:00 and offload your kayak & equipment. There will be volunteers there to assist. Parking: After you off-load your kayak you can park your car as usual near the finish: on-street parking (not in the Port of Cork). Mandatory Kayak Safety Briefing – 12:15 at Lee Rowing Club: Jim Kennedy (Atlantic Sea Kayaking) will give all kayakers a detailed Safety Briefing before launch. Launch from 12:15: Launch from the pontoon and paddle up to the Port of Cork. Arrival 13:00 Port of Cork: Paddle into the north channel where we’ll be holding all kayaks for the first starts at 13:30. Kayak Race: Please be assured that safety is at the fore in our planning and we’ll keep the kayaks separate from the rowing boats as much as possible. However, the racing area is very restricted and all participants need to mindful of each other. City Course kayaks will do two circuits and Monkstown Course kayaks will do one circuit. Recovery: will be as usual from the Port of Cork Marina. There will be volunteers to assist you. Kayaks must be collected from North Custom House Quay (strictly pick up only). Meet the Crews! 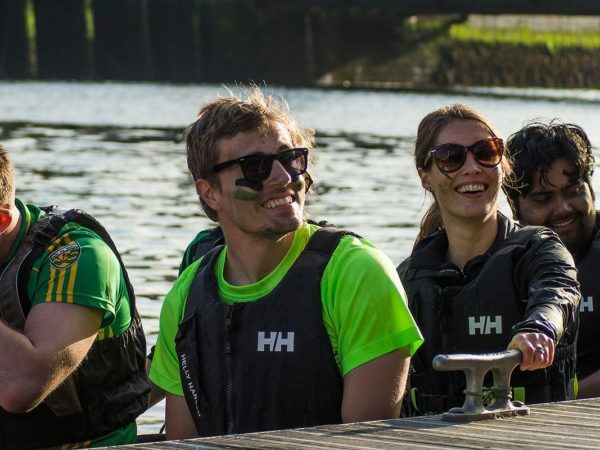 Friday 9 June, 18:00-20:00, Idle Hour Pub, Albert Quay, Cork: Gather with other crews and our host club Naomhóga Chorcaí to get the inside tips on the race, the new race course and the river. A warm welcome to all our visiting participants! Make it colourful: We’ve got over 200 boats this year and encourage all participants join the party! Hoist a flag in the stern of your boat, come along in fancy dress or paint your own crew battle-stripes on your face. The more colour the better! Prize Giving Ceremony: 19:30 at the Clayton Hotel, Lapp’s Quay, Cork. After-Party 21:00, at Idle Hour Pub, Goldbergs and The Sextant, Albert Quay: Unwind after the tough race and celebrate your achievements with a jig, a reel, and a cold drink in hand. Hosted by Naomhóga Chorcaí.